On the front end, Smart Voice received voice commands through the Smart Speaker or other Voice enabled hardware (e.g. Smart TVs etc). These commands are routed to the Smart Voice cloud platform where they are translated into backend Smart Home Hardware commands. This is done using the Smart Voice Smart Home Alexa Skill or the Smart Voice Smart Home Google Action. These skills/actions are installed on the chosen speaker or voice enabled device, and activated by linking the voice assistant account with the Smart Voice account. The cloud platform acts as the translation service between the voice assistant and the backend. 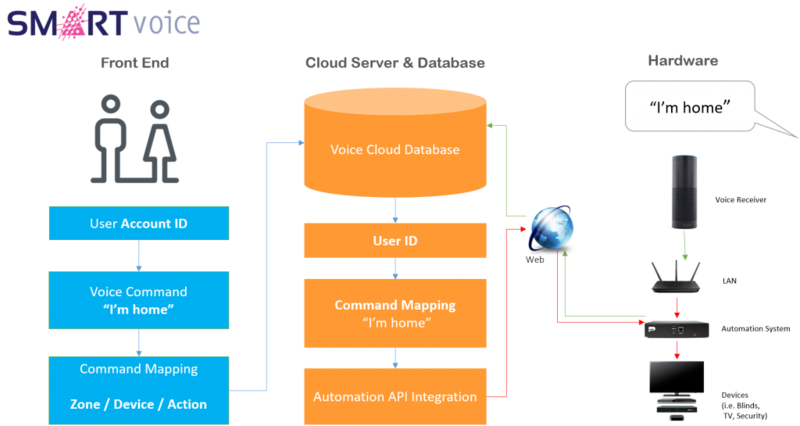 The cloud platform includes the Smart Voice portal which allows customized mapping of Smart Home commands from front end voice assistants to rooms and devices. Rooms and devices can be auto loaded from the Smart Home hardware such as C-bus and Nero. Rooms and devices are autoloaded and are then mapped through to specific voice commands, making the whole process very simple. Integrators can create set-ups for each of their customers and configure their properties as needed. Routines and scenes can also be created on the Smart Voice Portal. Access to the Smart Voice Portal is restricted to approved integrators.